So I’m going to a BlogHer conference this afternoon. I’ve never been to a blog conference, and if you told me 6 months ago I’d be going, I would have laughed at you. I’m not nervous at all or anything. Just ask Eric. He hasn’t had to listen to me freak out about the fashion bloggers, not once. Fashion bloggers, you guys. As in, people who exude so much fashion that they are selling their ideas. They will be at the conference. I swear, the idea of meeting them makes me more nervous than having to decide between chocolate chip cookies and Almond Roca Bars. I plucked my eyebrows in anticipation, even though I have straight-across bangs right now, so my eyebrows are not visible AT ALL. Speaking of eyebrows, my sister Nikki said one time that when she is in a hurry and only has time to do one thing to get ready, she pencils her eyebrows. This made me very concerned because we have the exact same eyebrows and I never do ANYTHING to mine. What’s the one thing you do when you have 5 minutes to get dressed? Mascara? Blush? For me it’s powder and bangs. I was trying to get Eric to help me pick out my nail polish color last night and he said, “Karen, if you’re going to bother doing anything to your nails, just go get a manicure.” Or in other words, “Give up now, Karen.” When I do my nails, they end up looking like I painted them using a pastry brush. It’s bad, guys. 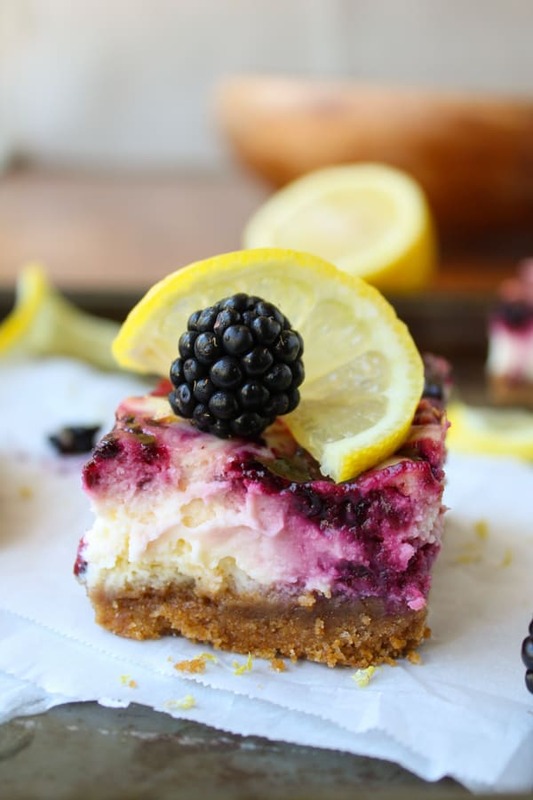 I’m kind of tempted to bring some of these Blackberry Lemon Cheesecake bars to the conference. Giving away food is the best the easiest way to win friends. Then I wouldn’t even need to tell people what The Food Charlatan is about. I’d be like here, *shoves cheesecake,* THIS is what I’m about!! 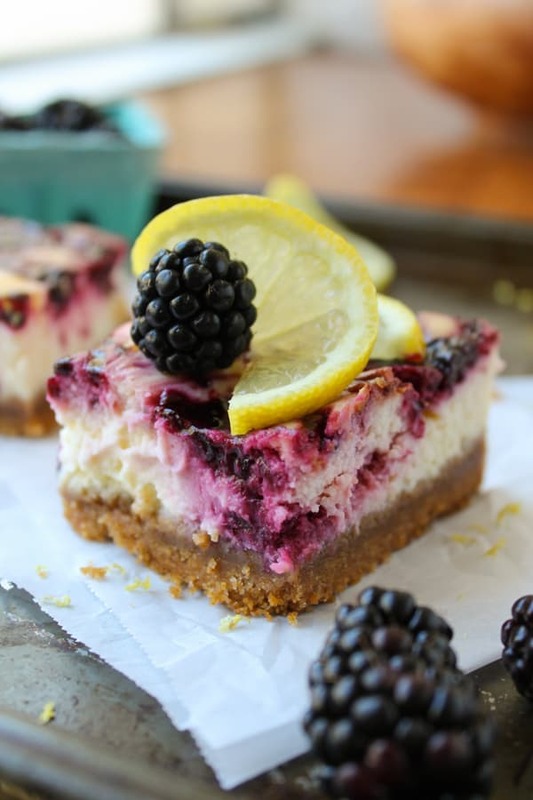 Creamy, bright lemon cheesecake with a smattering of blackberry puree on top. And the thickest crust you ever did see. It’s heaven you guys. This is a great make-ahead dessert. Absolutely no last minute prep. This is not a good last-minute dessert. Every single one of those “hurry up and cool down” minutes lasts an hour, I swear. But it’s best served completely chilled, so put your patient pants on. These bars are so worth it. Preheat the oven to 350 F. Set your cream cheese, sour cream, and eggs on the counter. Start with the blackberry puree. In a small saucepan, combine blackberries, 1/4 cup sugar, and water. Turn the heat to high and bring to a boil. Boil for 2-3 minutes, stirring occasionally, then lower the heat to medium. Continue to stir every now and then for 5-8 minutes. Break up the blackberries with the back of your spoon. The syrup should be thickened. 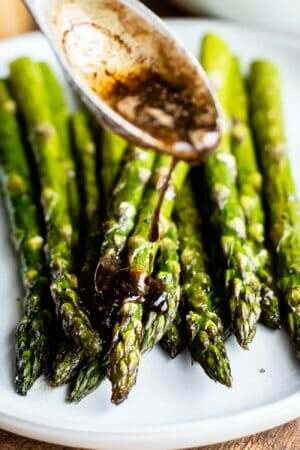 Set aside to cool, or throw it in the fridge. Meanwhile, make the graham crackers crust. 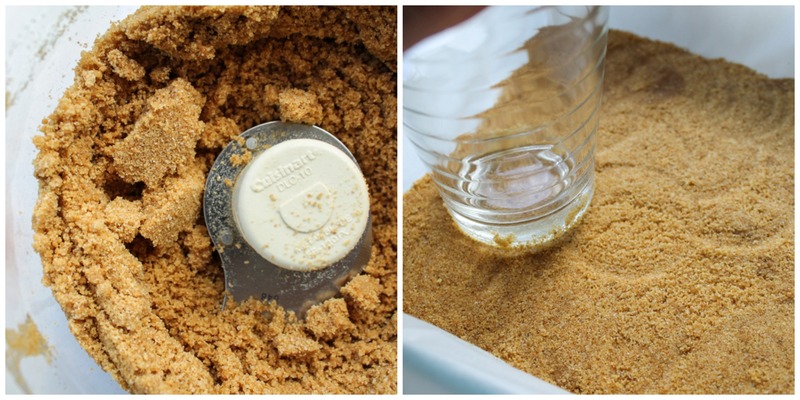 Pulse the graham crackers in a food processor (or smash them with a rolling pin) until they are very fine crumbs. Add the sugar and melted butter to the food processor (or mix it in a bowl) and pulse until it looks thoroughly moistened, like wet sand. Line an 8x8 inch pan with foil or parchment paper, if you want. (you don't have to, it's just easier to cut if you can lift it out.) Use the bottom of a glass to press the crumb mixture into the bottom of the pan (not up the sides). Bake at 350 F for about 9 minutes. Set aside to cool. Lower the oven temperature to 325 F.
In a large mixing bowl or stand mixer, beat together the cream cheese, sugar, salt, and lemon zest. 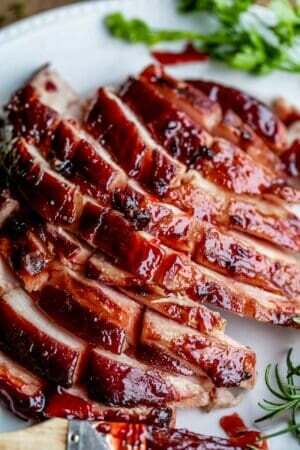 Beat on high for 3 or 4 minutes, scraping down the sides and bottom at least twice. You want the cream cheese to get high and fluffy. Add the sour cream and beat. Add the eggs in one at a time, beating in between. Add the fresh lemon juice and beat until smooth. Once your graham cracker crust is not too hot to touch, pour the cream cheese mixture into the pan. Smooth it out with a spatula. 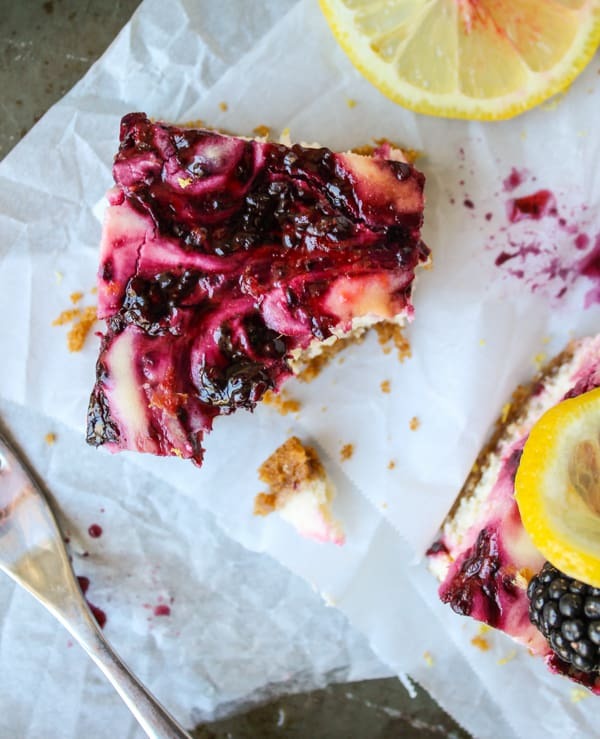 Use a spoon to dollop the blackberry puree all over the cheesecake. 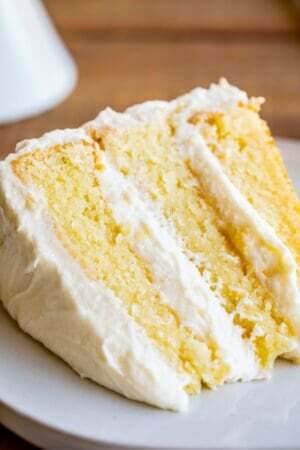 Use a sharp knife to swirl it together. Remember, less is more. You want to be able to see the white cheesecake on top, not just blackberry. Bake at 325 F for 55-60 minutes. Keep a close eye on it toward the end. When you shake the pan, the center should not be jiggling any more than the outside edges. (The cheesecake will definitely jiggle, it's not completely set yet. Just make sure it's not sloshy in the middle.) If the cheesecake starts to brown on top, definitely take it out. Let cool for at least an hour before putting it in the fridge. Refrigerate for at least 3 hours, covered. 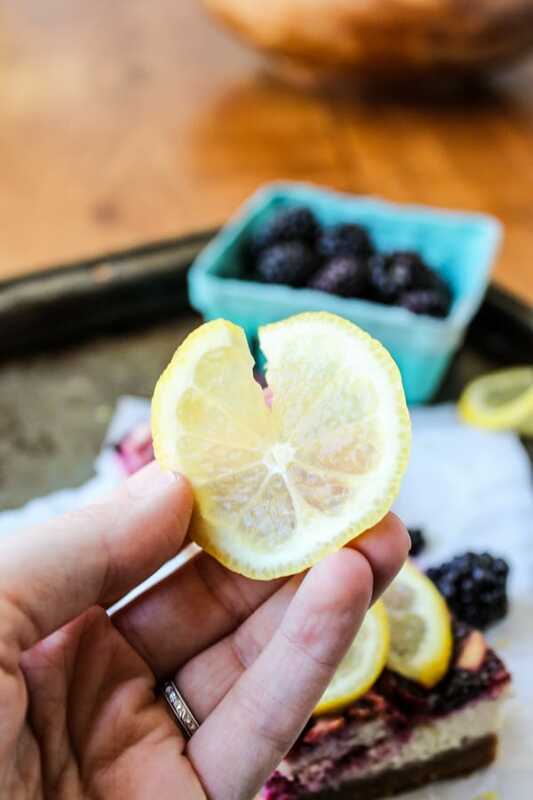 Garnish with lemons and blackberries. If you don't like blackberry seeds, strain the puree through a mesh sieve after it cools down. This cheesecake might crack. They're bars though, so who cares? They're like cheesecake's kid sister, they don't need to be quite so grown up. But if you don't want it cracking then feel free to look up some water bath options. Here’s how I cut my lemon to get that twisty thing goin on. Thin slice, then slice it halfway through and twist. These look so awesome! I’m trying to make some for Thanksgiving. There are going to be a lot of people there so I decided to double the recipe. I am fairly certain I got everything right but the consistency of my cheesecake looks too loose and when I put the blackberry puree on top most of it sank into the cheesecake. I just put it in the oven and I’m hoping it will still be alright. Even if all the blackberries are inside I’m sure it will still taste great! Hey Bre! I’m so sorry your blackberries sunk! Let me know how it turns out. I’m not sure if they will rise , I doubt it since the fruit is heavier than the cheesecake. I’m not sure what to tell you, doubling the recipe shouldn’t have made any difference! I hope they taste great! These were amazing. 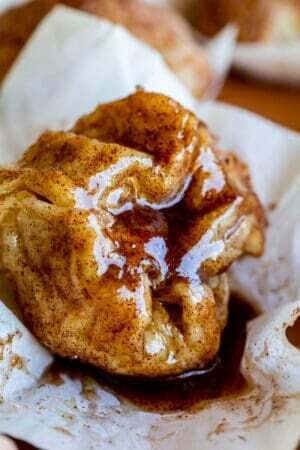 I made them for dessert and it made our night! Such a treat. They were not too sweet, just right. Loved them. Will definitely be making these again, and soon. yummy! That is awesome Jessica! I love a success story like that! Hard to beat cheesecake. Thanks for the comment! I’m so sorry they didn’t work out for you Jill! They are not supposed to be completely set when you take them out of the oven, the whole cheesecake should wiggle a little bit when you shake it. I’ve changed the recipe, hopefully it makes it more clear. I hope you had a great time!! I can be all full of nerves too when it comes to things like that. I think I actually started to feel a little panic attack coming on, on your behalf as I was reading this. ; ) But then I came back down when you started talking about the bars, which sound amazing!! I hope you had a great time at the conference Karen! I’m sure everyone loved you and that you looked beautiful! 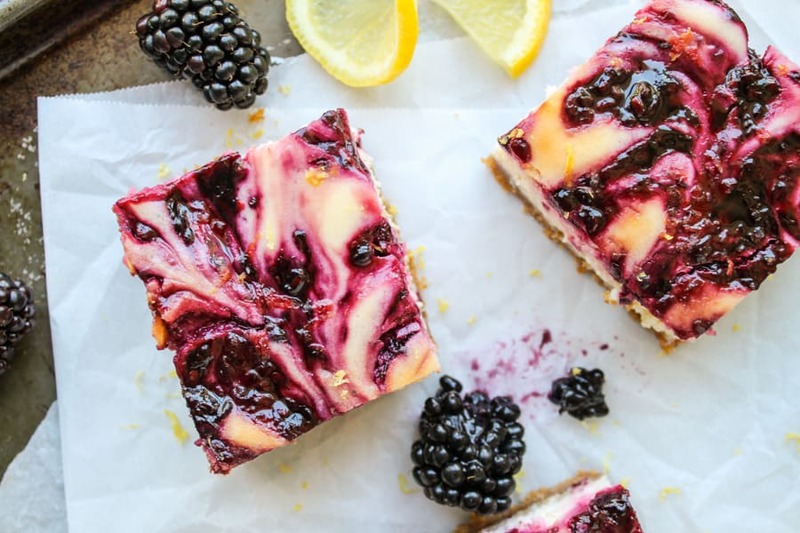 These blackberry lemon cheesecake bars look amazing! So creamy and those beautiful berries in them are the perfect touch! These look amazing! Love your site – your prosciutto chicken is a new fave! Following for sure! Thank you Stephanie! Gosh wouldn’t that be a perfect meal? That prosciutto chicken followed up with these beauties? Sounds like a perfect meal for company. Thanks for stopping by Stephanie! These are beautiful…your photography is beautiful…you are beautiful! So wonderful to get a glimpse into your home where all this food magic happens! DANG girl!! These bars look absolutely amazing!!!! I hope you had a blast at BlogHer! I went to BHF but wasn’t able to get away to this one. Can’t wait to make these bars, pinned! xo! Karen, can’t wait to her about BlogHer! And these bars are beautiful! Oh man, Karen, I’m sitting here with a grumbly tummy now. I wish you shoved cheesecake in my face! Also – I love that we both have straight across bangs for the same reason – definitely made sure my eyebrows were cleaned up for BlogHer:) So great meet you – can’t wait to cook some of your recipes! GIRL! These look soooo good! I love this flavor combo. Pinned!! I hope you’re having a great time at BlogHer! I’m so jealous. I hope to be there next year(!) and be able to meet all you wonderful ladies! those look absolutely delicious! 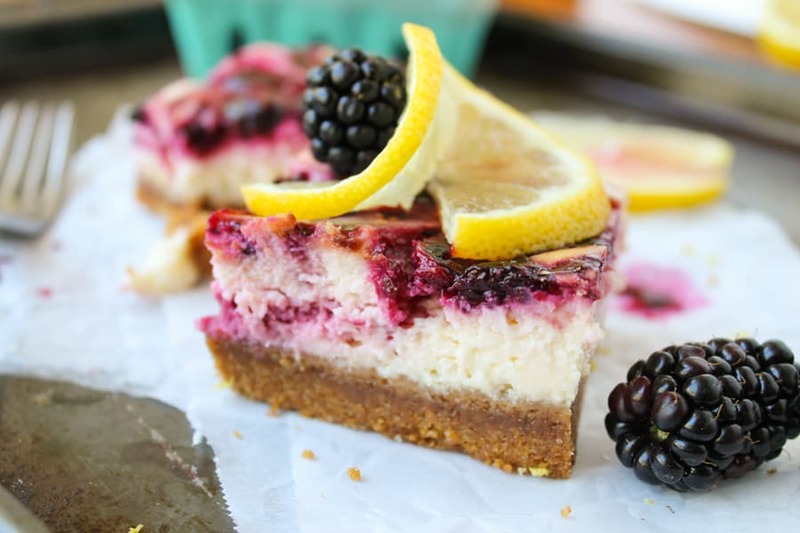 this will be the next cheesecake recipe I’ll try, that’s for sure! Hi Karen have fun at your conference. This cheesecake will make you very popular indeed! Have fun at the conference, Karen! Bloggers aren’t that scary. And if those fashion bloggers are mean to you, that just means they don’t get any of your cheesecake, which is a devastating loss for them. As for the face – I used to get up early and do my makeup. Now, I sleep until the last possible minute, change into whatever clothes don’t smell, and slap on some eyeliner and a bright red lip. Takes two minutes. Done. And I totally use the I-have-bangs-therefore-you-cannot-see-my-sasquatch-level-eyebrows trick. It doesn’t help with the mustache above my lip but small steps. Back to this cheesecake – damn, girl, this looks heavenly. I’m all about the crust so I’m ecstatic over the perfect thickness of yours. And these photos are gorgeous gorgeous gorgeous! Don’t forget to tell us all about your conference experience! These look pretty. And since I’m literally up to my eyeballs in blackberries I can use all the recipes I can get! :) Good luck, can’t wait to hear all about it! Hope you have SO much fun at the conference Karen! Sorry I couldn’t make it with you. Would have been so fun being roomies! And you have GOT to get on the eyebrow bandwagon. I have light hair like you, and I use Omega eyeshadow by Mac, and an angled brush, and just lightly fill them in. Makes such a difference! You’re eyes really pop, and it looks great in photos. You must report back with all the great stuff you learned in the conference! I’ll live it vicariously thru you. 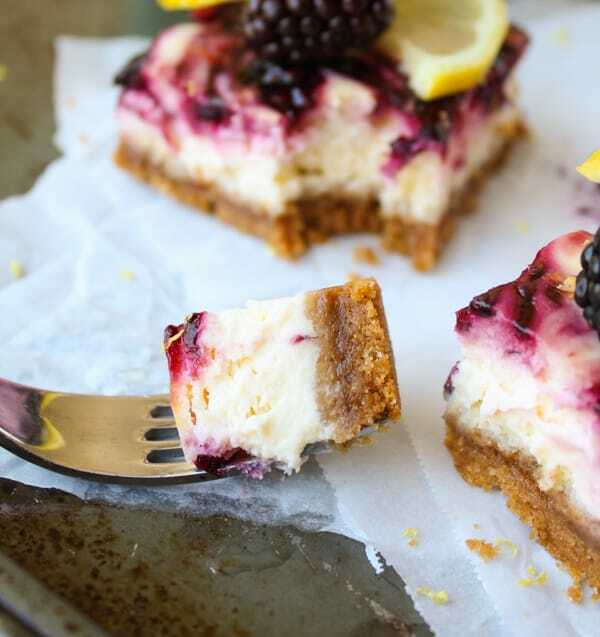 Oh, and these cheesecake bars? Delicious! 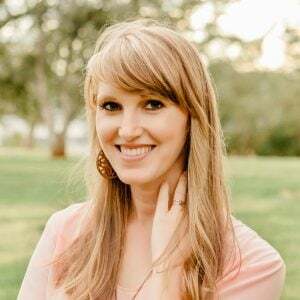 If you bring them, you’ll be the most popular blogger there. Duh! Oh blackberries – thanks for posting a recipe that I won’t be able to stop thinking about ;). These look so gorgeous, deliciously amazing, and might I add perfectly swirly! Just eat one or two of these as a confidence builder and you will rock it at the conference!! Have a great time! You are going to be awesome at BlogHer. Seriously. Everyone wants to hang out with the food bloggers. They smell good and have mysterious knowledge about whisking and blanching and sauteing. Plus, everyone knows that food bloggers have actual skills that would be good to have in case of a zombie apocalypse. Fashion bloggers? They’d be the first to be eaten. These look great. Great color. Enjoy the conference. Looks delicious! Making your slow-cooker chicken chili you recently posted for potluck on Sunday. Maybe these will go with it. Good luck and have fun Karen! I can’t wait to read your post-blog conference blogs. I’m getting ready to laugh. Out loud. Oh my gosh. These would be amazing with the fish tacos you posted…I’d love to do a blackberry lime version too…would that be good or do lime and cream cheese have problems together?